2m x 3m x 5mm, 2013. The penitential system of Russia has not changed significantly since Soviet times. There are more than 10 types of different penal institutions, such as those only for women, or only for juvenile males, etc. The installation consists of 10 transparent sheets, each containing the locations of prisons in one type of penal institution. 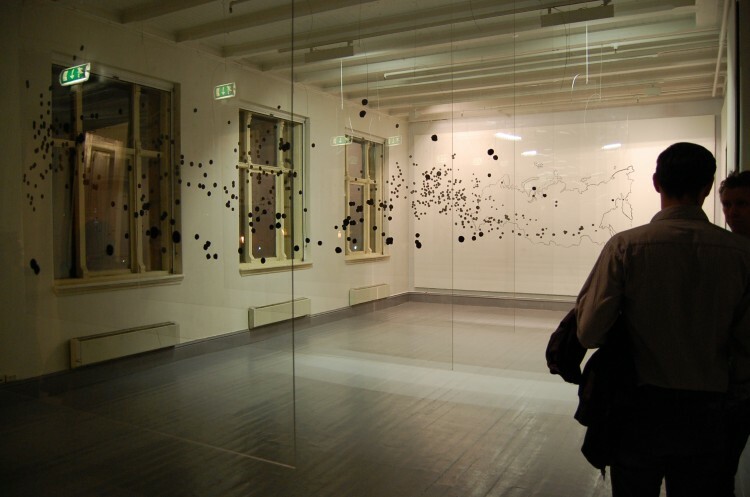 The visitor can investigate these sheets individually, or cumulatively, with a view of the map of Russia, which can be seen through the maze of black marks on the back wall.